Crimes of Persuasion: Ponzi schemes as investment fraud technique. 05/06 - SANTA ANA, Calif. - (AP) -More than 50 former investors packed the courtroom Friday at the sentencing hearing for an Orange County man charged with running a $311-million fraud scheme over nearly two decades. Ten of the victims testified against James P. Lewis Jr., who faces up to 30 years in prison for defrauding about 1,600 investors. Lewis, 59, pleaded guilty to one count of money laundering and one count of mail fraud last October after he was arrested in Houston in 2004 following a nationwide manhunt. Prosecutors agreed to drop 12 of 14 counts in exchange for the pleas. Former investor Collene Campbell testified she and her husband lost the money they were saving for a down payment on their granddaughter's first home, a grandson's college savings, and the contents of a scholarship fund for another grandson. "James Lewis did not make a mistake in investing our money, he didn't invest it at all. ... He just stole it," Campbell said, fighting back tears. "We are suffering and yet all those thousands of nights (Lewis) could sleep and carouse while he was sucking the life blood from his victims." Jenny Jackson said she and her husband depended on their investments with Lewis' company to supplement their retirement income. "The money for our retirement is entirely gone. Our dreams for the future are crushed," she said. Lewis, who wore a prison jumpsuit and was shackled at the wrist, was expressionless during the testimony. During the hearing, federal prosecutors and Lewis' attorney argued about the value of the net loss, which is a key element in deciding his sentence. Brick Kane, the court-appointed receiver for Lewis' holdings, testified that Lewis took in $311 million between 1985 and 2003. U.S. District Judge Cormac J. Carney asked how Lewis could keep up his scheme for nearly two decades. "As long as you're able to raise money and keep paying the promised annual or monthly payments, you can keep going until you implode," Kane said. "And Mr. Lewis was about to implode when he was arrested." Lewis told investors he was earning returns of 18 percent to 40 percent by leasing medical equipment, financing purchases of medical insurance, making commercial loans and buying and selling distressed businesses. But prosecutors alleged that instead Lewis was using money from new investors to pay off the original ones - something known as a Ponzi scheme. Kane testified that some early investors did receive money back, leaving the total loss at $156 million. Defense attorneys, however, have argued that the net loss to investors was much lower. The company that is liquidating Lewis' property holdings issued a report last year that he lost $35.5 million in unprofitable businesses,$22 million in the foreign currency market and spent at least $15 million on his wife, two girlfriends and their families. 05/06 - Orange County money manager James P. Lewis Jr. was sentenced today to 30 years in prison for defrauding investors - many of them fellow Mormons whom he met through church contacts - through a Ponzi scam that cost his clients $156 million over two decades. Lewis, 59, who had given up his right to a trial, pleaded guilty in October before U.S. District Judge Cormac Carney to one count of mail fraud and one count of money laundering. Many of Lewis' estimated 1,600 victims flooded the court with letters urging a long prison term. A 72-year-old man, once retired, wrote that he now "must work until life ends" because he lost his savings. Another aggrieved investor told how he retired early to do missionary work based on his faith in Lewis - and now must sell his home to survive. Yet another, no longer able to afford gasoline, clothes or lunch with friends, said in a letter that Lewis "imprisoned me for lack of money." "Many victims are elderly who lost their entire retirement savings to a man who spent their money on cars, houses and jewelry for himself, his wife, and girlfriends - while holding himself out as a man of morals and righteousness," Assistant U.S. Atty. Gregory W. Staples said in a sentencing memorandum. Prosecutors had argued for a 30-year-long sentence, given the scope of the crime. Defense attorney Scott M. Schlegel argued for a 10-year sentence, and said prosecutors had wrongly portrayed Lewis as "a one-dimensional villain." A 30-year sentence, he said, was the same as life in prison for Lewis, who turns 60 next month. Lewis has been held without bail since January 2004, when he was arrested after a nationwide manhunt at a budget motel in Texas, where he had used a senior discount card to knock $6 off the room rate. He had raised $311 million from investors who often forked over the money after hearing family members, friends or fellow churchgoers describe his returns - nearly 20% a year on an "income" fund that paid dividends, or 40% on a "growth" fund that did not. Billing his operation, Lake Forest-based Financial Advisory Consultants, as perfect for individual retirement accounts, Lewis lulled the investors with payments of "dividends" and sometimes return of their invested funds. But as he admitted in October, the payments were made using funds from other investors in a classic Ponzi scheme. Lewis' fraud succeeded for so long by attracting retirement money that the investors wouldn't need for years, said Barry Minkow, a former fraud perpetrator who recently testified before the U.S. Senate about Lewis and other scams targeting the elderly. Minkow, a former teen tycoon who spent seven years in prison for defrauding investors in his Reseda-based ZZZZ Best carpet cleaning company, is now an anti-fraud consultant and tipped authorities to Lewis' scam. He said investors were reassured by how long the operation had been in business, and law enforcement officials were hard to convince that a fraud could have lasted so long. Most would say: "If this were not real, how could he be up and running for close to 20 years with the income fund and the growth fund?" Minkow said. Lewis told his victims he was turning big profits by buying and selling distressed businesses, leasing equipment to medical offices and financing medical insurance premiums. In fact, prosecutors said, he made only a few tiny investments, lost $22 million trading foreign currency futures, and squandered millions on cars and expensive homes for his ex-wife in Laguna Niguel, a girlfriend in Villa Park, and another girlfriend in Greenwich, Conn. Under a court order obtained by the Securities and Exchange Commission, receiver Robb Evans & Associates of Sun Valley has been liquidating Lewis' assets and suing hundreds of clients who were paid more than the money they invested, hoping to reclaim some for the losing investors. So far, Evans has recovered nearly $11 million, of which investors will get $9.5 million after legal and accounting fees and other expenses, Evans' deputy Brick Kane said. 05/06 - An Orange County man was sentenced to 30 years in prison and ordered to pay back the $156 million he bilked from about 1,600 people in a Ponzi scheme that spanned over two decades. U.S. District Judge Cormac Carney imposed the maximum sentence on James P. Lewis Jr. Friday, describing the scheme as a "crime against humanity." The judge also acknowledged it was unlikely he would be able to pay back the money. Lewis pleaded guilty to one count of money laundering and one count of mail fraud last October after he was arrested in Houston in 2004 following a nationwide manhunt. Prosecutors agreed to drop 12 of 14 counts in exchange for the pleas. Defense attorney Scott Schlegel called the punishment a "death sentence" for Lewis, who is 59. Many of Lewis' victims were fellow Mormons whom he met through the church. More than 50 of the former investors packed the courtroom during the sentencing hearing. Former San Juan Capistrano Mayor Collene Campbell testified she and her husband lost the money they were saving for a down payment on their granddaughter's first home, a grandson's college savings, and the contents of a scholarship fund established in memory of another grandson, who died in 2001. "We are suffering and yet all those thousands of nights (Lewis) could sleep and carouse while he was sucking the life blood from his victims," Campbell said, fighting back tears. Lewis, who wore a prison jumpsuit and was shackled at the wrist, remained expressionless during the testimony. He told the judge he felt "sorry and shame and deep remorse as I stand before you." Prosecutors said Lewis raised $311 million between 1985 and 2003 by telling investors he was earning returns of 18 percent to 40 percent by leasing medical equipment, financing purchases of medical insurance, making commercial loans and buying and selling distressed businesses. In fact, prosecutors said, he made only a few investments and lost $22 million trading foreign currency futures, and spent millions on cars and expensive homes for his ex-wife, two girlfriends and their families. 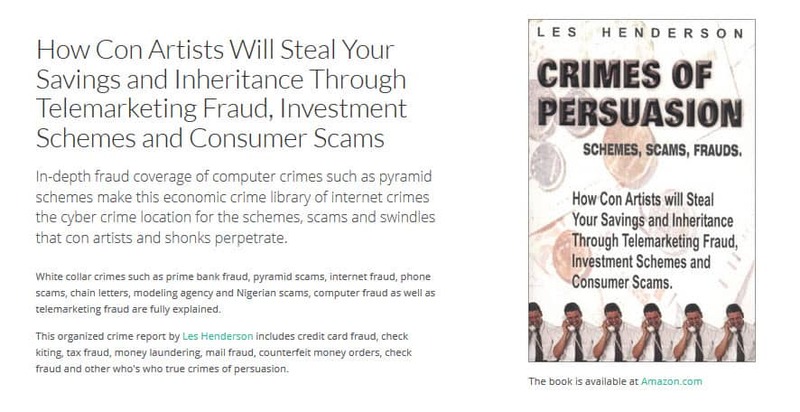 Lewis kept the scheme going for nearly 20 years by using money from new investors to pay off the original ones — something known as a Ponzi scheme. Brick Kane, the court-appointed receiver for Lewis' holdings, testified that some early investors did receive money back, leaving the total loss at $156 million.